One of the first things you should do when seeking a contractor for hire, is to ensure that they are properly insured and certified. Why these so important? Often, their line of work can be dangerous. They need to be trained with the different types of equipment that they use and how to install the various products that they work with. By being certified and insured, it serves not only as protection for them, but for the homeowners and the homes they work on. That’s a good start. Next, you need keep an eye out for other signs as well. For example, if there is to be any substantial demolition during the project, ask them if they’ve contacted a safety or building inspector. When tearing out loadbearing walls or floors, it could render a building unstable. This could result in a hazardous situation for the contractor and his crew, or the residents of the home. 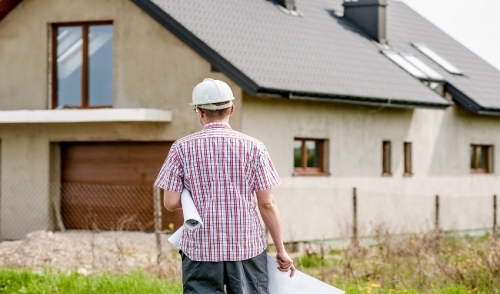 A safety or building inspector can be there to ensure that the work will be completed safely and that the home will be restored to a structurally sound condition. Some easy telltale signs of whether or not they are following safety regulations are if they’re wearing personal protective gear. According to OSHA, nearly 6.5 million people work at approximately 252,000 construction sites across our country every day. Of all national industries, the fatal injury rate is higher in the construction industry than the national average. The most common injuries occur from falls, ladder/scaffold collapse, electrical shock, and failure to use personal protective equipment. It’s easy enough to observe while the contractor and crew are working, to see if they are taking any safety shortcuts. Is their equipment in good repair? Many power tools have safety guards incorporated for a reason. If you happen to see any of these safety features circumvented or removed altogether, it is a good sign that your contractor doesn’t hold safety in very high regard. OSHA has a safety checklist available on their website that can help people take steps to avoid hazards that can lead to injury, illness or fatality.